Violations of minority rights in Iran take place within a wider, well-documented context of human rights violations, and intolerance of dissent and difference. 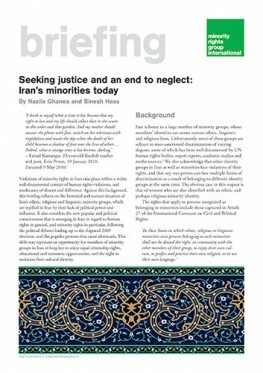 Against this background, this briefing reflects on the historical and current situation of Iran’s ethnic, religious and linguistic minority groups, which are typified in Iran by their lack of political power and influence. It also considers the new popular and political consciousness that is emerging in Iran in regard to human rights in general, and minority rights in particular, following the political debates leading up to the disputed 2009 elections, and the popular protests that came afterwards. This shift may represent an opportunity for members of minority groups in Iran at long last to enjoy equal citizenship rights, educational and economic opportunities, and the right to maintain their cultural identity.